About 85 percent of the energy consumed in modern society comes from fossil fuels. Vast sums have been invested in the existing energy landscape – the petroleum refineries, petrol stations, natural gas fields and pipelines, coal mines, and electric grids that power modern societies. Solving the climate challenge will require major changes in this supply infrastructure and the built environment that it feeds. Today, power plants produce about 30 percent of all carbon emissions. To meet the growing need for electricity in developing countries while simultaneously reducing greenhouse gas emissions, the amount of carbon released per unit of electricity production must fall 75 percent by 2050. This will require phasing out older, inefficient coal plants, and replacing them with a mixture of combined- cycle natural gas, nuclear, wind, geothermal, biomass, and solar power, steps that would lead to dramatic air quality improvements in many mega cities of the developing world. Carbon capture and storage technology – if it proves cost effective and can be developed in a reasonable time frame – would enable the continued use of coal. The transport sector – trucks, cars, buses, airplanes, cargo ships, railroads – is overwhelmingly dependent on petroleum. 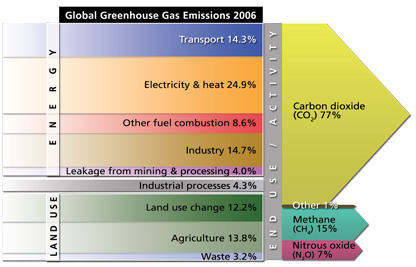 Today, transport of goods and people is responsible for about 19 percent of carbon emissions. With the global car population forecast to soon exceed 1 billion vehicles, while growth in crude oil production is likely to end, dramatic increases in vehicle fuel efficiency can advance economic prosperity, energy security, and climate protection. Hybrid, plug-in hybrid, and all-electric vehicles, along with large investments in mass transit, are needed to reduce transport sector emissions in the long run, and to extend limited petroleum supplies. Residential and commercial buildings consume the bulk of the world’s electricity and much of its natural gas. Improving the design of new buildings and retrofitting old ones can dramatically improve their energy performance. Many existing buildings can be made up to 90 percent more efficient, and new buildings are actually capable of producing more energy than they consume. It takes energy to get energy, and the gathering, processing, and delivery of fossil fuels account for 8 percent of carbon emissions. Production of steel, cement, automobiles, and other manufactured products is responsible for about 20 percent of global carbon emissions. Improvements in the carbon intensity of these activities are possible, profitable, and necessary.